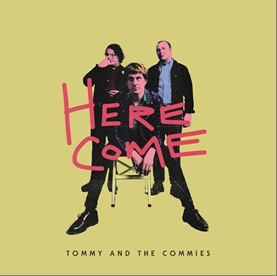 From swingin Sudbury, Ontario, CA (nada), here come TOMMY and the COMMIES with their debut recordings for Slovenly Recordings, Here come Tommy and the Commies! "Here Come." is 16 blistering minutes of hooliganistic mod-punk madness featuring Jeff Houle, also known as the sole brain behind budget rock cult faves STRANGE ATTRACTOR, and his brother Mitch, known ? collectively as the power-pop force STATUES of P. Trash Records fame. Swagger drenched youngster frontman Tommy Commy recruited Strange Jeff by dragging him into a bathroom stall during a punk show, playing him an inaudible demo on a phone. The Houle Two agreed to join forces for Tommys first foray into the world of record making on the strength of giving "Spiral Scratch" era Howard Devoto a run for his dosh on the vox on any given holiday. This kid has GOT IT, BABY! In a perfect modern world, songs like "Devices," and "Suckin In Your 20s" would be massive chart smashes on the level of "Teenage Kicks." Those days are long gone, but here we are in 2018, giving YOU what you need, and what THEY dont deserve.